Sackboy's second outing will miss its release date no longer, and Europeans will be getting LBP2 sooner than they might have thought. LittleBigPlanet 2 was originally scheduled to hit shelves along with everything else in November, but then it didn't. The game was in need of a bit more development time, said the creators at Media Molecule, and the title was delayed to early 2011 - January 18th in North America, with a big fat "TBA" everywhere else. Well, there shall be no more delays. According to the PlayStation Blog, LBP2 has had all the extra development it needs, and the game has gone gold. In other words, it's 100% complete, and Media Molecule's employees can now take a well-deserved holiday break (cutting it close to the wire, weren't you, guys?). As far as Europe goes, it turns out our readers across the pond won't be waiting that much longer at all: LBP2 will hit shelves on the mainland on January 19th, and in the UK on the 21st. I'm not sure I understand why the UK gets it a day later - all y'all run on PAL systems, don't you? 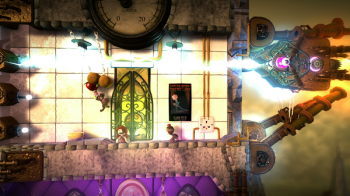 It isn't like there isn't already an English translation of the game, either; it can't take that long to add in all the extraneous "u"s.
Either way, the first LittleBigPlanet was a charming platforming romp with some great user-created content, and LBP2 gives players even more tools to create things like fully-fledged 2D fighters. If you're on the fence, a demo will be going up on PSN today in North America, tomorrow in Europe.